Richmond Fellowship Leicestershire Life Links are a mental health wellbeing and recovery support service. They work across Blaby District, Oadby and Wigston and Leicester City. The service is available for people over the age of 18. Face-to-Face - information, advice and navigation services. Tailored, one to one and group support sessions. Freephone - Support line open between Monday-Friday 9am-5pm. Specialist trained staff provide you with support and advice on personal needs. You can self refer or be referred by a health professional. Let's Talk-Wellbeing is a service that provides psychological assessment and treatment for what are know as mild to moderate common mental health problems, which 1 in 4 of us suffer with at some stage in our lives. It is not uncommon to experience changes in moods, stress levels and emotions, especially when there maybe pressures and changes going on in your life. Your physical health may also affect your mood and stress levels. Talking with a qualified therapist can provide a chance to help to think through what is going on and develop ways to help move forward. There are 2 teams of the Leicestershire Reablement Service, one in the East and one in the West. The East Team cover Blaby District. The Service works with adults with complex mental health difficulties and is person centred approach. The service links with the Recovery College at LPT. They provide an initial 12 weeks reablement support and plan with the person, what their goals are and how they want to be supported in achieving these. They accept referrals from your care coordinator, psychiatrist, social care worker or GP. You can also refer yourself but they may need to get more information from your GP or other professionals involved in your care. Connect : take the time to speak to family, friends, build relationships with the wider community. Be Active : take up a new hobby, start walking, join a local sports club or community venue. Take notice : be aware of your surroundings, people and the environment, often we rush from place to place, plugged into our phones and social media. Breathe, relax and look around. Keep Learning: keep putting off things? Learning a new skill/hobby? Build up your confidence and self esteem by taking part in a new experience. Give: time for friends, family, neighbours, loved ones. Really listen to them, be in the moment not thinking about how busy you are or that your in a rush. Volunteer or help out a neighbour. 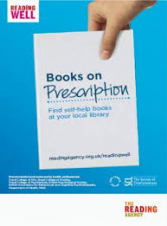 Reading Well Books on Prescription helps you to understand and manage your health and wellbeing through helpful reading. The scheme is run by The Reading Agency in partnership with the Society of Chief Librarians with funding from Arts Council England and the Wellcome Trust. It is endorsed by health organisations, including NHS England and Public Health England, and delivered through public libraries. There are four Reading Well lists currently available for adult common mental health conditions, for people with dementia and their carers, young people's mental health and long-term conditions and their carers. The Health for Teens website, created by Leicestershire Partnership NHS Trust. The website includes a lively, accessible short film for young people about mental health resilience. There are also opportunities for users to access quality information and materials about mental health problems that affect children and young people. They can also keep an on-line "mood diary" which can help them understand how their mood can change. Kooth is a free, confidential, safe and above all anonymous way to ask for help. It's currently available to over half a million 11-25 year olds in England and Wales and is now operational in 33 geographical areas. Kooth is a transformational lifeline that has successfully helped and continues to reach the very vulnerable, many of whom would never have access to face-to-face counselling. You can go to a Keep Safe Place if you're out and about and need to go somewhere to feel safe or get help for a few minutes. If you have a Keep Safe Card you should show this to the staff. You should carry your Keep Safe Card with you when you're out. If you need help the emergency services or Keep Safe Place will check to see if you have a card. You can get a Keep Safe Card from police stations and council offices. In Blaby District these are located at our main reception desk. If any of the material or information you have read raises concerns with you regarding your own mental health please speak to your local GP.